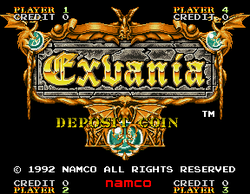 Exvania (エクスバニア, lit. Ekusubania), is an arcade game that was released by Namco in 1992 only in Japan; it runs on that company's NA-1 hardware, and was the first Japan-exclusive title from them to display the Federal Bureau of Investigation's "Winners Don't Use Drugs" screen in its attract mode. As with Bakuretsu Quiz Ma-Q Dai-Bōken and F/A, it doesn't use a Yamaha YM-2151 FM sound chip. The players must take control of four medieval lords, named Ward, Emilio, Charles and Karl, who are fighting for control of the land (the eponymous "Exvania"); they'll have to battle through eight different castles, and try to gain control of each one. When one of the lords wins a battle, he'll receive a medal - and once he has won three medals, he will gain control of the current castle (which means that they can be up to six rooms long) and the game will proceed to the next castle. The gameplay is also very similar to that of Hudson Soft's Bomberman series, the initial title of which had been adapted by Irem for arcades in 1991; the lords will start out in the four corners of the screen, and can only be killed by bombs, but a strike from the whips will temporarily stun them. The game's name is a reference to the fact that it is a parody of Konami's Castlevania series - or "Akumajō Dracula" as it is known in Japan. First castle of the game. This page was last edited on 24 January 2014, at 18:40.